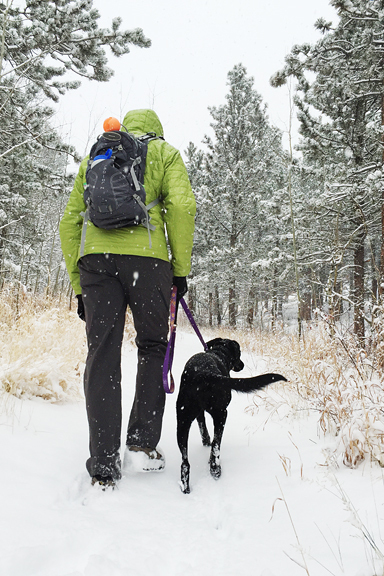 Winter is trying to make its way into Colorado, but it has been a slow process. Little storms sandwiched between warm and sunny spells aren’t conducive to good skiing, or any skiing for that matter. At least the storms are finally coming, and hopefully they are gathering strength. 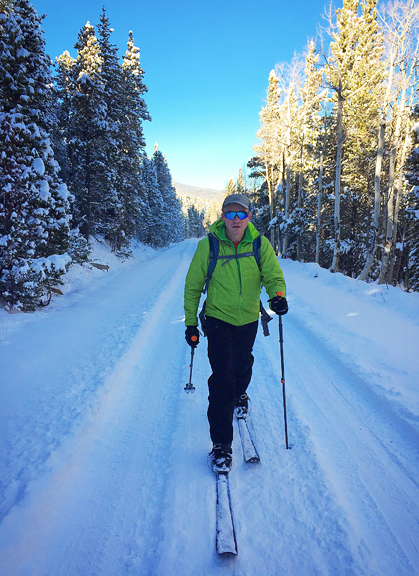 The past couple of weeks have been an emotional slog for me, so it was nice to pack up our little family and head to Crested Butte for Thanksgiving week. I don’t want to be social. I just want to be with my pack (Jeremy and Neva), work, and get some damn snow to ski. Of course, our version of Thanksgiving is very un-Thanksgivingish. We’re not having turkey (we’re having ribs) and we aren’t spending it with extended family. It’s the introvert’s Thanksgiving. This suits Jeremy just fine because he is an introvert through and through, but even extroverts (me) can only take but so much before they need to lie low and recuperate. 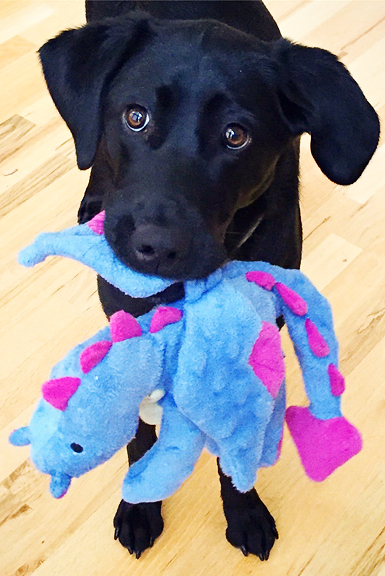 However, we ARE thankful for so much: good people, health, kindness, compassion, love, opportunity, wild spaces, one another, and that crazy furry baby dog. I hope you all enjoy and/or survive your Thanksgiving festivities with as much love and thanks as your hearts can give and then some more. That’s what it is really all about. Today’s recipe is most definitely un-Thanksgivingish. Maybe it’s in part because I am not a fan of turkey, but mostly it’s because you should file this away for the holiday season and beyond. I am a huge fan of Korean barbecue – particularly galbi. But Korean barbecue short ribs require marinating time and can be messy to eat. Put this in the form of a meatball and you have shaved off quite a bit of time and everything is packaged into a delicious little morsel. Kalbi (I see it spelled both galbi and kalbi) meatballs, people. 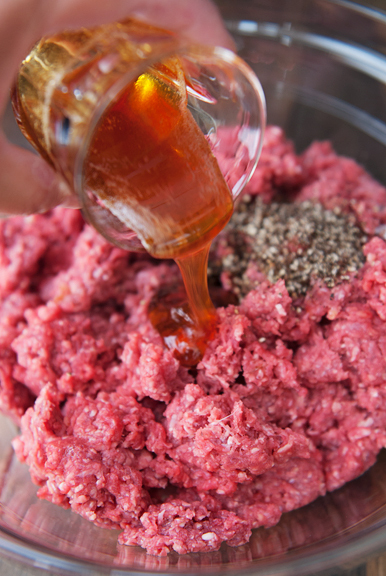 The marinade goes into the meatballs, which I kind of love because I always hate throwing the marinade away. 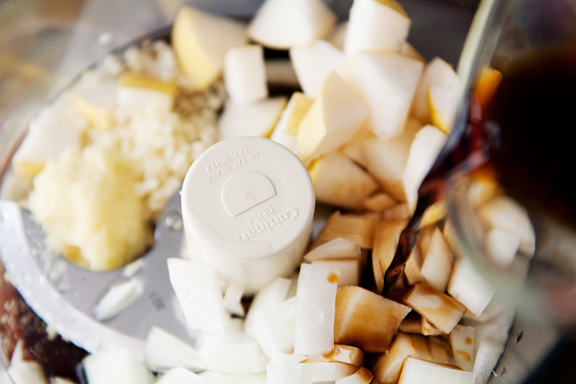 It takes a few minutes to prepare the ingredients and mix them all together. 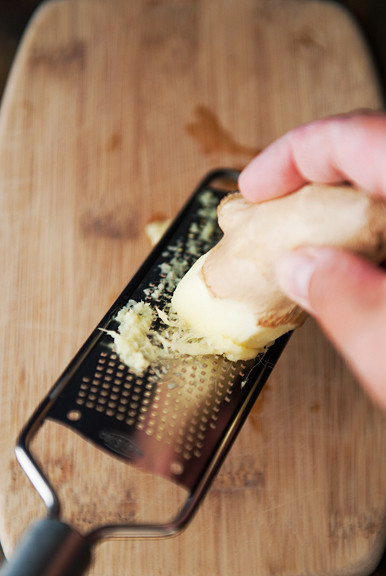 The process goes quickly, which is why this works so well for entertaining or a weeknight meal. Shape the beef into one and a half inch balls. This is probably the most time-consuming step, but it will go quickly if you can enlist the help of a few additional hands. Set the meatballs on a rimmed baking sheet lined with either parchment or foil – it makes for easier clean up when dealing with the burnt juices on the pan. 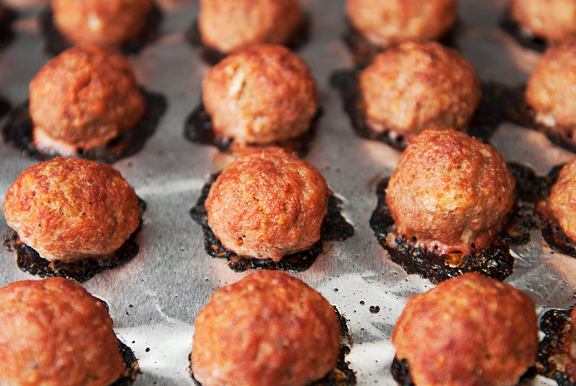 We love these meatballs. They have the kalbi flavor, but are much leaner than their short rib cousins. 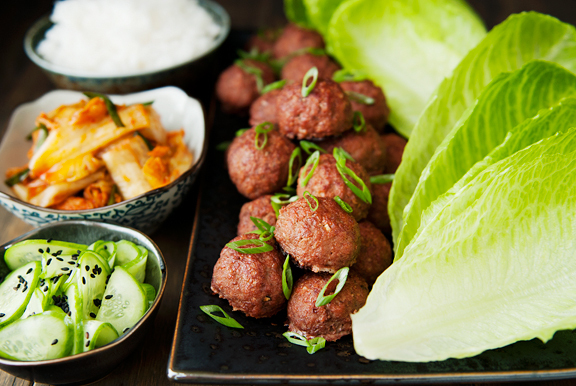 The kalbi meatballs are especially delicious served with steamed rice, lettuce, kimchi, and Asian-style pickled cucumbers (sugar and rice vinegar). That said, no one will fault you for eating them straight up. It’s a quick and easy way to get my kalbi fix! Preheat oven to 450°F. Line a rimmed baking sheet with foil or parchment paper. 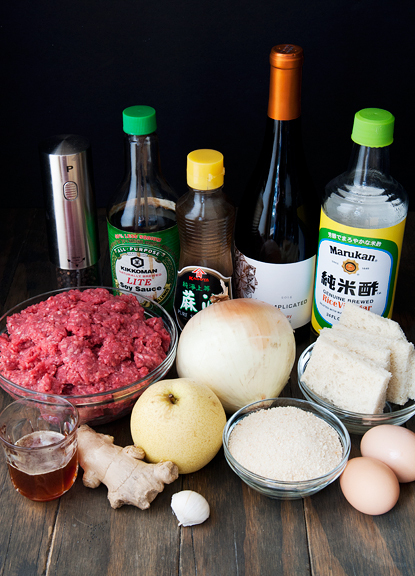 In a large mixing bowl, combine the ground beef, honey, black pepper, sesame oil, and the rice vinegar. 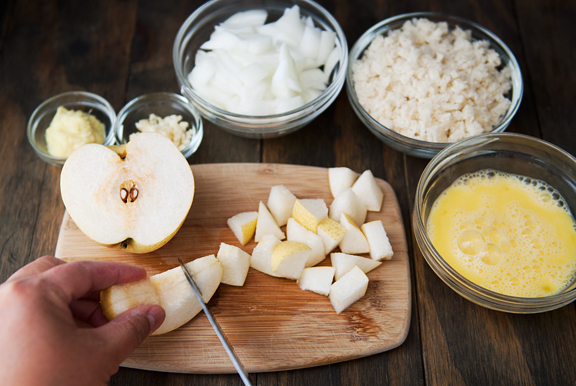 Place the pear, garlic, onion, ginger, wine, and soy sauce in a food processor or blender and purée until smooth. 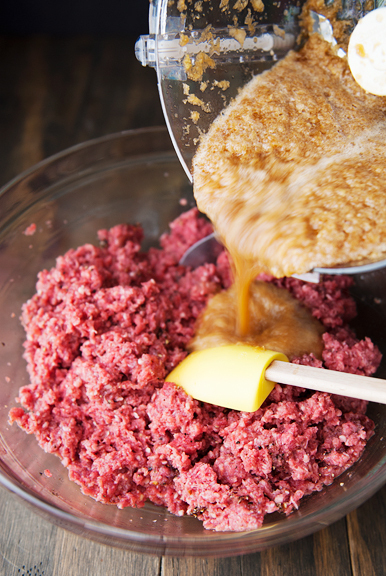 Mix the purée into the beef. 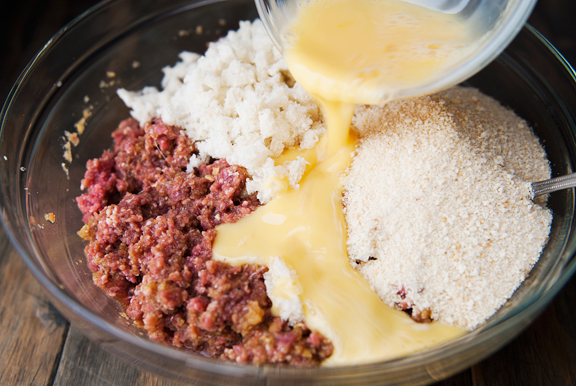 Add the beaten eggs, minced bread, and bread crumbs to the beef. Mix until combined, but not sticky. 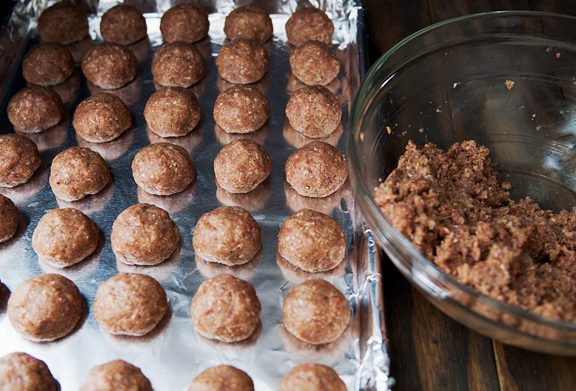 Roll the beef into 1 1/2 inch meatballs and arrange on the baking sheet with an inch of space between each ball. Roast the meatballs for 20 minutes or until cooked through and nicely browned on the outside. Let cool for 5 minutes before serving. 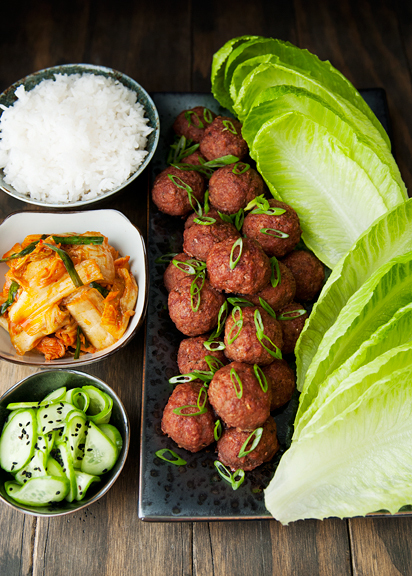 Serve with scallions, lettuce, kimchi, and steamed rice. Makes about 60 meatballs. 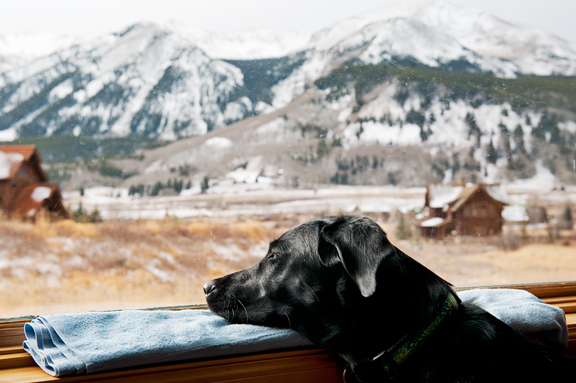 A few days ago, I heard that there was snow in Crested Butte and I thought of you. I knew it would make you and Jeremy happy, and Neva, too! I’ve saved the recipe. It looks yummy, and I have everything I need except for the Chardonnay and the Asian Pear (I LOVE those pears). I think I’ll give it a try. Thanks so much for your blog. I don’t always save the recipes, but I always love your pics and narrative. Ooooh….I’m trying to figure out what to serve visitors the day after Thanksgiving, and this is going on the shortlist! Sounds delicious. I hope you get some good snow. These look delish! What could I substitute the breadcrumbs for if I have someone who is gluten free? I’m with you… I am adverse to the whole Thanksgiving thing, as I spend most of my time in life in a service capacity and it’s exhausting. All I want to do for Thanksgiving is disappear and NOT eat Turkey. Except that my family, who means everything to me, does love the whole Thanksgiving thing. So I compromise. I spend the day with them and then pack off for the beach (no one but ME!!) for a week. Walking in the cool sand, meditating, reading and eating LOTS of fish. I love, love Korean food and just bought this cookbook about a month ago. Galbi is one of my favorites as well, but I love the idea of making this into meatballs and eating them like a ssam. Maybe I’ll make these while I’m at the beach and spend a few days noshing on them! We’ll have to see how the fishing goes though, because if the fish are biting, it’s fish I’ll be eating! Have a lovely Holiday Jen, with just you and your pack. love meatballs and and love to have a new recipe, these flavors look wonderful! thank you for sharing this anti-turkey recipe! heather – The cool thing is that it’s less work making these meatballs :) And I still love the ribs, but the meatballs mean that I’ll be opting for this version more often than not! Kristin – We got some snow, which is better than none. Hope you all enjoyed whatever you decided to make! Jill – Mmm, did you barbecue? Elise – I think Ian’s makes gluten-free breadcrumbs and I read somewhere that someone uses crushed rice crispy cereal, but Kellogg’s doesn’t make gluten-free rice crispy cereal anymore – so look carefully if you go that route. Other brands might be GF? Martha – Thank you, I hope it was nice to see folks! I just wanted to let you know that I made these last night and they were so fantastic! Thanks for a great recipe! And for a way for me to enjoy kalbi without having to remember to marinade it the night before!! WOW! These are wonderful. I had no white wine so i skipped it and the mixture was very very wet but i forged on and they turned out wonderfully! Thank you for the recipe. Mine were a little charred on the bottom after 20 minutes (I imagine the honey had something to do with that!?) but i love a good crust on my meatballs so that was a none issue for us – just a tip for others that might want balls a little less crispy.